Luxury brands and designer labels, jeweler’s boutiques, handmade accessories, art galleries, the most exclusive butchers’ shop in the Aegean area and a brand new high end shopping mall in Psarrou, the famous celebrities’ beach: all you have to do when in Mykonos is set your shopaholic instincts free and indulge yourself to what may be the most spectacular shopping experience of your life. 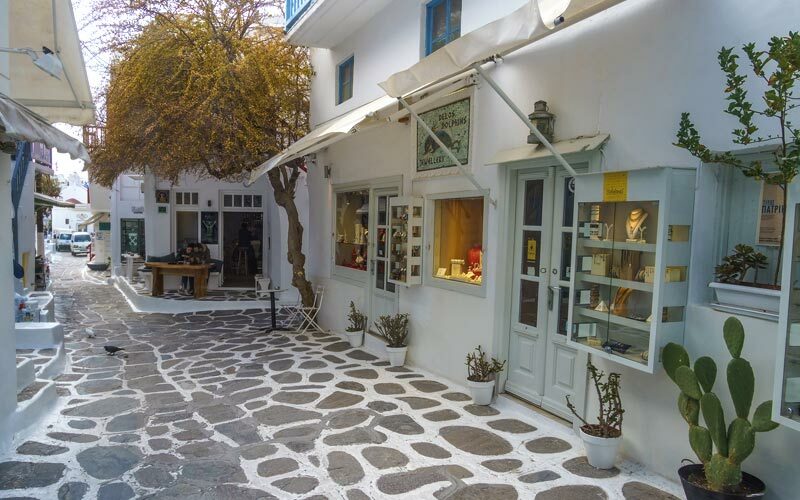 The consumers’ paradise in Chora, the town of Mykonos, is called Matoyianni; a long, narrow paved street where shops are almost connected with each other and never close before midnight. Their colorful variety reminds of a fascinating patch-work: legendary designers’ boutiques next to bakeries, local food products stores and little white washed shops where old ladies sell handmade leather sandals. In Matoyianni you can find almost anything you dream of and meet almost anyone who has made it to the celebrities’ report. Only a few decades ago, paparazzi would chase around Mykonos shopping center legends like Maria Callas, Grace Kelly or Jackie Kennedy Onassis. The inheritance left from this unforgettable era to the shop owners is that you treat absolutely every client like a kind, as the bearded, barefoot and almost ragged unidentified customer might very well be an incognito Oscar awarded star or worldwide tycoon. Another area in which Mykonos merchants have become experts is efficiency and discretion when catering for their most demanding clientele. They are ready to serve their clients anytime and anywhere; might that be on a super yacht, at their luxury resort or even at their residence address back home. It is needless to add that all upscale resorts feature their own posh boutiques with exclusive signature brands. Latest addition to the island’s shopping universe is the Nammos Mall that opened this summer on famous Psarrou beach. The shopping center is built according to the local architecture and is expected to change Mykonos’s lifestyle, offering more eclectic shopping opportunities for VIP visitors from all around the world. Buying tips: jewelry, local products and selected souvenirs are a must. Nevertheless don’t underestimate the fact that Mykonos is a growing and fascinating art market.